The tetrio sphinx, Pseudosphinx tetrio (Linnaeus), is a common moth in the American tropics and subtropics that less frequently occurs in southern parts of Florida. 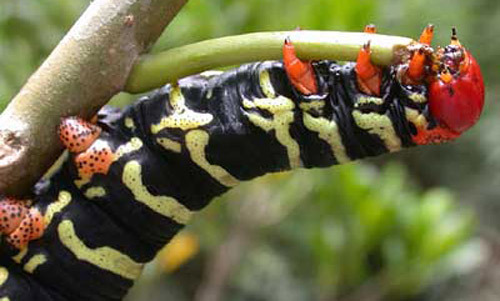 Although the adults exhibit mostly drab grey coloration, larvae are conspicuous, large caterpillars that often occur in gardens feeding on frangipani and other members of the dogbane family (Apocynaceae). Figure 1. Pseudosphinx tetrio (Linnaeus) adult; dorsal view; wingspan 12.5 cm. Photograph by James Dunford, University of Florida. Other names in the literature synonymous with Pseudosphinx tetrio include Sphinx plumeriae (Fabricius), 1775 (Santiago-Blay 1985). Figure 2. County records of Pseudosphinx tetrio (Linnaeus) in Florida. Illustration by Kathryn A. Barbara, University of Florida. 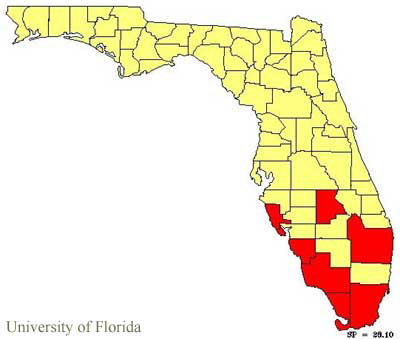 Given the conspicuous coloration and size of the larvae, their occurrence in gardens and landscape settings, and the popularity of sphingids among insect collectors, additional Florida records undoubtedly occur but they are probably restricted to southern counties where host plants (i.e.Plumeria spp.) exist. Adult: The dorsal forewing is brownish with a dark spot at the base of the costal margin and blurry gray and white markings. The dorsal hindwing is dark brown with white along the inner margin and the lower half of the outer margin. The body is striped with transverse grey-white bands and wider black ones. Average wingspan is 12.7 to 14 cm (females are typically larger than males and lighter in color). Eggs: Eggs exhibit no sculpturing except for minute punctures on the surface. They are pale green, ellipsoidal and measure approximately 2.2 to 2.5 mm. 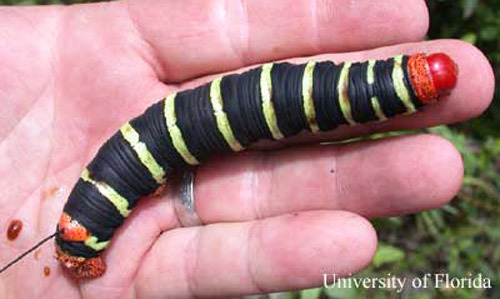 Larvae: Larvae are velvety black with yellow rings and a reddish-orange head. They can attain lengths of up to 6 inches. The black 'horn' located on abdominal segment 8 is approximately one inch long and is located on an elevated orange 'button'. Thoracic legs and prolegs are orange with black spots. Newly molted larvae are light yellow and dark gray in alternating transverse rings; several hours after molting, larvae become their typical yellow and black coloration. Figure 3. Pseudosphinx tetrio (Linnaeus) larva showing relative size on adult hand; Maricao Forest, Puerto Rico. Photograph by Gino Nearns, University of Florida. Figure 4. Pseudosphinx tetrio (Linnaeus) on Plumeria alba, Buck Island, St. Croix, U.S. Virgin Islands. Photograph by Dan Clark, Florida/Caribbean Exotic Plant Management Team (FCEPMT), National Park Service. Figure 5. Close-up of Pseudosphinx tetrio (Linnaeus) larva feeding; Maricao Forest, Puerto Rico. Photograph by Gino Nearns, University of Florida. Pupae: Newly formed pupae are yellow, and after two to three hours brown spots appear on the surface. The pupal coloration eventually darkens to a yellowish-brown with lateral dark stripes on the thorax and rings on the abdomen. The final color after fully hardening is a uniform dark reddish-brown; pupal length is approximately 7.0 cm. Females lay approximately 50 to 100 eggs in clusters on leaves of the host tree. The larval color pattern is a typical aposematic warning sign that they are potentially toxic to predators. 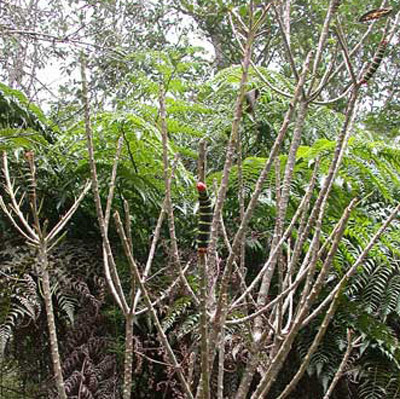 Host plants in the family Apocynaceae produce white, toxic latex that Pseudosphinx tetrio is able to detoxify and possibly sequester for defense purposes. Some cuckoo birds in Belize however are not deterred and have been reported feeding on larvae (Meerman 2002). The larva has been hypothesized to be a coral snake mimic in Costa Rica (Janzen 1980). Janzen (1980) also reported that larvae wave their anterior portion back and forth when disturbed and bite when handled. Larval hairs have also been reported to cause a clinical case of keratitis (Merle et al. 2001). Jahnes et al. (2002) conducted preliminary studies to define the interactions and bioactive properties of Pseudosphinx tetrio larvae and the host plant Himatanthus sucuuba (Spruce ex Müll. Arg.) Woodson. Himatanthus sucuuba bark extracts are used as an anti-inflammatory and to treat various ailments such as anemia, arthritis, and cancer. Minno and Darrow (1995) suggested that native Florida host plants may include the apocynaceous vines Rhabdadenia biflora (Jaqc.) and Echites umbellata Jacq. These vines occur in salt marshes and at the edges of mangrove forests in southern Florida. Adults eclose from pupae in leaf litter or subterranean chambers. Several adult flights occur in Florida from March to September. Adults are known to nectar on rosy or sea periwinkle (Vinca rosea L.). Gribel and Hay (1993) recorded Pseudosphinx tetrio adults nectaring on Caryocar brasiliense Cambess. in Brazil and suggested that it may be a minor pollinator along with bats for that plant species. They observed the relatively short proboscis of Pseudosphinx tetrio coming into contact with plant reproductive structures while feeding. Adults are attracted to lights and flowers at night. Frangipani trees have lemon to gardenia-like fragrant and waxy flowers that are used in Hawaiian leis. They are typically planted to create a tropical look in urban areas. Some varieties grow up to 25 feet with an equal spread. There are also smaller varieties that grow to heights of 6 feet. Frangipani trees originated in the New World tropics, from the Caribbean Islands and Central America. 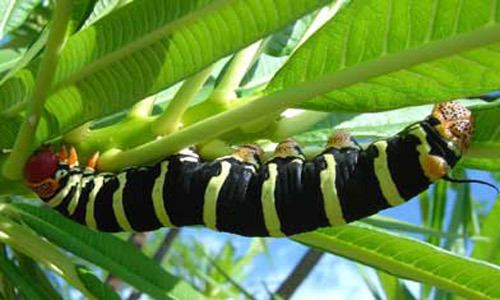 Tetrio sphinx caterpillars often appear in gardens or landscaping and can defoliate frangipani trees in a few days or couple of weeks. One caterpillar can devour three large leaves per day. They typically start feeding from the leaf tip and have been known to feed on tree stems if leaves are unavailable. They are typically present from July to September in southern Florida. Figure 6. Pseudosphinx tetrio (Linnaeus) larvae defoliating a tree in Maricao Forest, Puerto Rico. Photograph by Gino Nearns, University of Florida. Figure 7. 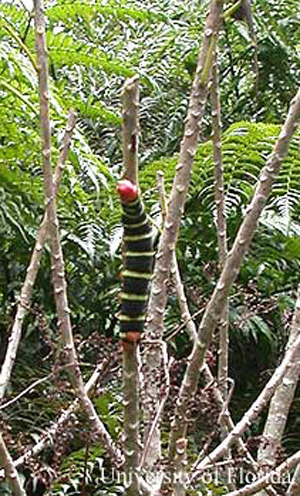 Closer view of Pseudosphinx tetrio (Linnaeus) larva defoliating a tree in Maricao Forest, Puerto Rico. Photograph by Gino Nearns, University of Florida. Mechanical: Hand-picking larvae is probably the best way to eliminate them from trees. Biological: Use of a biorational or "soft" pesticide product with spinosad or Bacillus thuringiensis (B.t.) will also work (Gabel 2003). Their presence and feeding habits typically do not cause severe damage to hosts and trees typically survive Pseudosphinx tetrio defoliation. Brown CH. 1976. A survey of the Sphingidae of Sanibel Island, Florida. Journal of the Lepidopterists' Society 30: 230-233. Burmeister H. 1855. Abhandl. Naturforschende Ges. zu Halle, 3, Sitzungsberichte. p. 65. Burmeister H. 1856. Abhandl. Naturforschende Ges. zu Halle, 3, Sitzungsberichte. p. 68. Butler AG. 1877. Revision of the heterocerous Lepidoptera of the family Sphingidae. Transactions of the Zoological Society of London 9: 610. Cramer P. 1780. De Uitlandsche Kapellen Voorkomende en Drie Waereld-Deelen Asia, Africa en America. Amsterdam. p. 175. Fabricius JC. 1775. Systema Entomologiae sistens Insectorum Classes, Ordines, Genera, species, Adiectis Synonymis, Locis, Descriptionibus, Observationibus. Leipzig. 832 pp. Gribel R, Hay JD. 1993. Pollination ecology of Caryocar brasiliense (Caryocaraceae) in Central Brazil cerrado vegetation. Journal of Tropical Ecology 9: 199-211. Hodges RW. 1971. 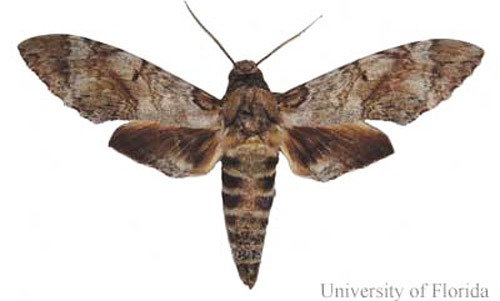 Sphingoidea: Hawkmoths. The moths of America north of Mexico, Fascicle 21, EW. Classey Limited, Middlesex, England and RBD. Publications, Inc., Washington, D.C. 158 pp., 14 pls., and v-xii pp. Linnaeus C. 1771. Mantissa Plantarum Altera. Stockholm. p. 538. Lucas PH. 1857. Ordre des Lepidoptères. In Ramon de la Sagra, Histoire physique, politique et naturelle de l'île de Cuba 7: 474-750. Merle H, Suchocki D, Gerard M, Donnio A. 2001. Keratitis due to caterpillar of Pseudosphinx tetrio hairs. Journal français d'ophtalmologie 24: 635-639. Minno MC, Darrow HN. 1995. Pseudosphinx tetrio (L.) (Lepidoptera: Sphingidae) in the Florida Keys. News of the Lepidopterists' Society 1: 5-6. Morton JF, Ledin RB. 1952. 400 plants of eouth Florida. Text House, Inc. Coral Gables, Florida. 134 pp. Santiago-Blay JA. 1985. Notes on Pseudosphinx tetrio (L.) (Sphingidae) in Puerto Rico. Journal of the Lepidopterists' Society 39: 208-214. Walker F. 1856. List of specimens of Lepidopterous insects in the collection of the British Museum. London. 8: p. 198. Publication Date: March 2005. Latest Revision: July 2014. Reviewed: December 2017.